"Who Killed Superwoman?" - Part 4: "Together Again: For the Very First Time"
Lana Lang is dying, and her powers that make her Superwoman are the cause. 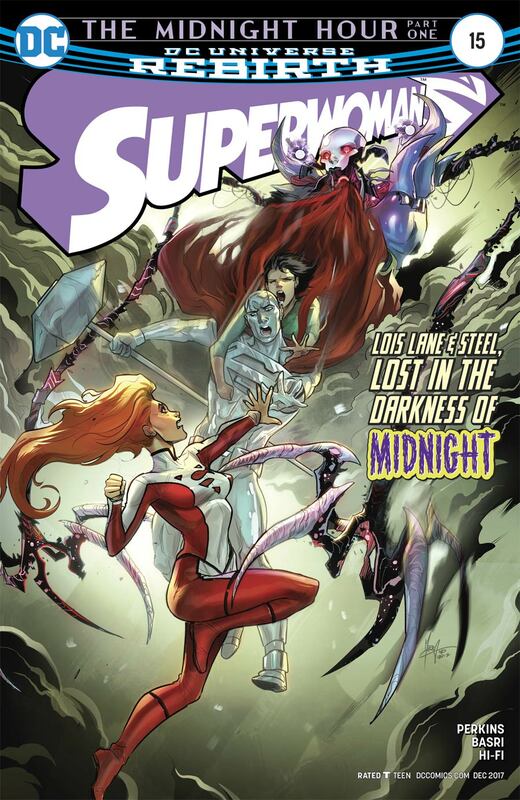 Lois Lane has returned, but in a form that only Lana can perceive. 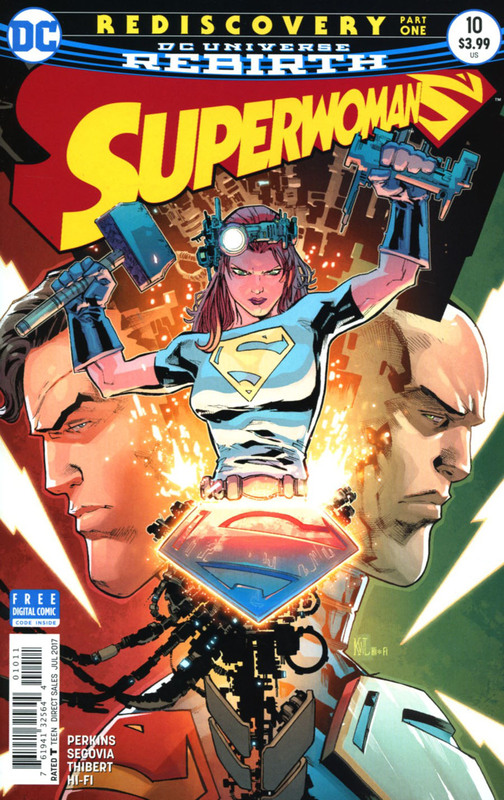 Lex Luthor is trapped in a temporal prison, and the Bizarro Superwoman along with Lena Luthor are about to decimate Metropolis. "Who Killed Superwoman?" - Part 5: "Together Again: For the Very First Time"
Lana Lang is still dying, but her powers are still needed as Lena Luthor is about destroying Lex Luthor's legacy, with extreme prejudice. Against Steel's protestations, Lana becomes Superwoman once more, but pays the price by issue's end. "Who Killed Superwoman?" - Part 6: "Come Dancing"
Lana Lang is aided by one of her adversaries, the bizarre clone of Superwoman, and is able to defeat her doppelgänger. She then locates Lex Luthor, and receives additional assistance from Atomic Skull, before ending on yet another cliffhanger. "Who Killed Superwoman?" 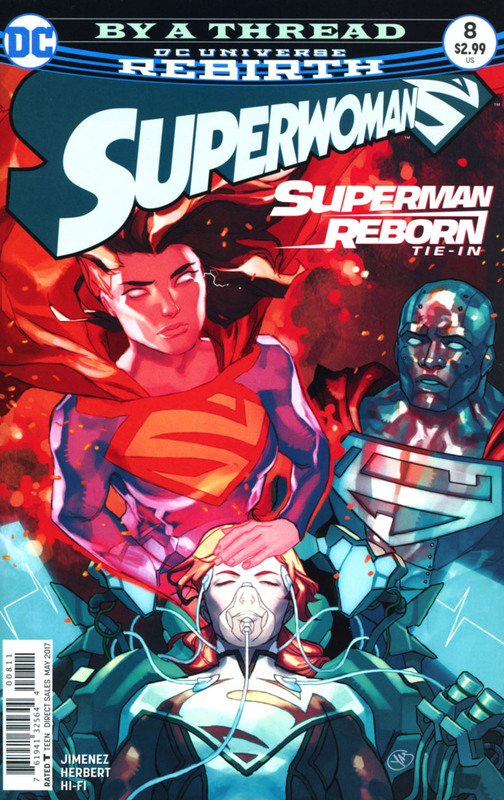 - Conclusion: "Never Be Satisfied"
Superwoman and company face down Lena Luthor, and though successful, Superwoman's final fate is still uncertain as she proceeds to mimic the same throes that befell the New 52 Superman before he finally perished. "By a Thread: Superwoman Reborn?" 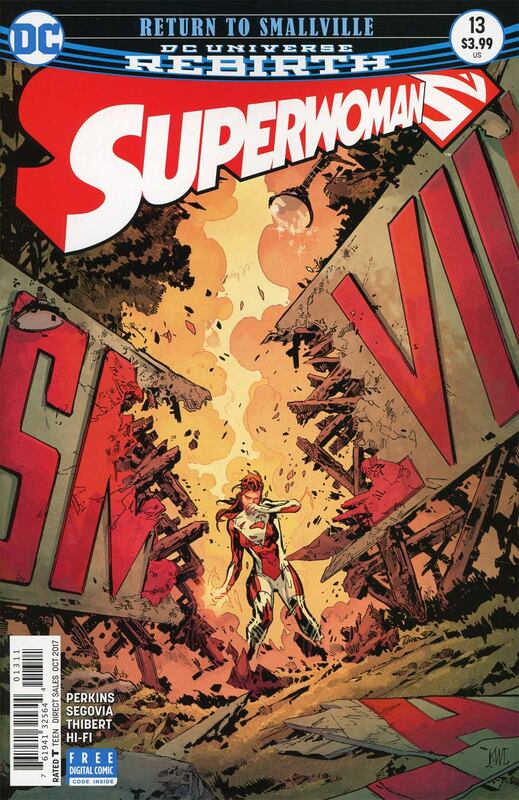 In a state of imposed reverie, Lana Lang/Superwoman, carries on a discussion with the people of her past. The conversation provides her with direction, but not freedom from her unconscious state. 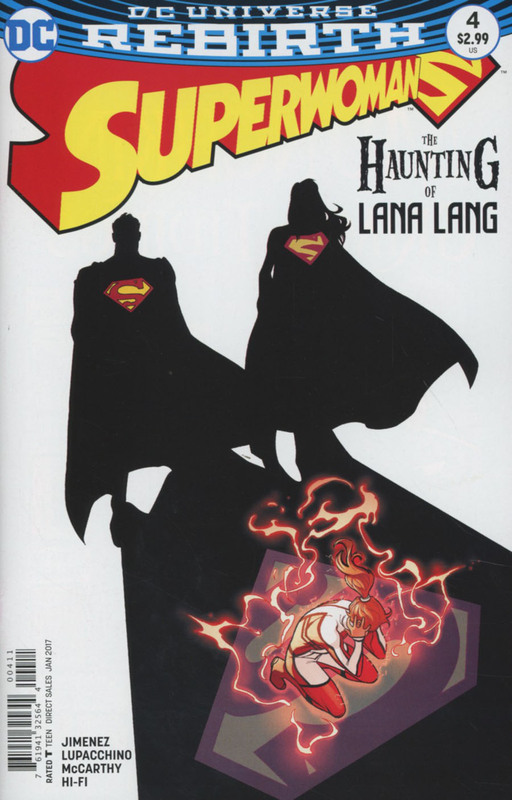 Lana Lang has been saved from death, but has lost the powers that made her Superwoman. John Henry tries to console her, but it takes Superman and an unintended emergency to clear Lana's mind and provide her with direction. The Insect Queen armor still retains the energy that Lana Lang lost, and she decides to use it to battle Skyhook, a villain responsible for the abduction of Zeke Irons, the nephew of John Henry Irons. Superwoman (Lana Lang) learns the whereabouts of Skyhook, and seeks to capture him without telling John or Natasha Irons, as she wants to protect them from doing something foolish. Instead, she bungles the situation and is left with the questions of failure. Lana is having some tests done on her new suit which allows her to still be Superwoman after losing her original natural powers. Meanwhile Atomic Skull is chasing down Shockwave in hopes of coercing the location of Crash Irons, Zeke's father who has vowed to take down Skyhook. Upon capturing Shockwave, Maggie Sawyer and Atomic Skull play a game of good cop/bad cop and he tells them where to find Crash, but also reminds them that Crash has a past of selling illegal exotic weapons, that was then and this is now. Crash want's closure for his son Zeke, he vows he is coming for Skyhook tonight. Back at Lana's apartment John Henry Irons has his bags packed and informs Lana that he needs time to think. Lana tries to find out why and John says, "Zeke is my family not yours, it's not your business to decide how we deal with his loss". Meanwhile, Crash has found Skyhook and attempts to take him out, but fails to get the job done. Superwoman, Steel and Crash's daughter show up. Crash is so caught up in his son and his killer/abductor that he completely disregards her. Steel has to knock out Crash to get him to stop his pursuit. After a brief battle the heroes subdue Skyhook as Maggie Sawyer shows up to take Skyhook into custody. 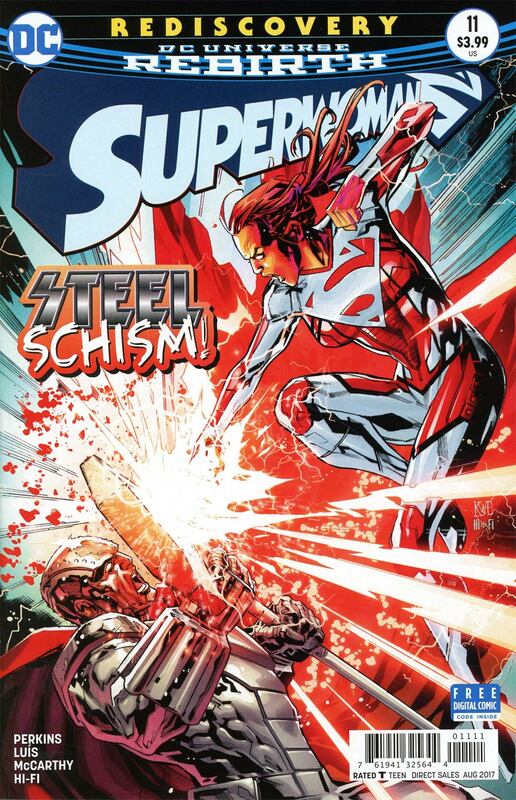 Superwoman informs Steel and Crash's daughter that it wasn't the suit that continued to give her powers, but the armor was channeling the power that she had inside her all along. She says she is not through learning about her powers and knows where to start. As our story opens, Smallville is on fire, the 'Welcome to Smallville' sign, the fields and a dialog that reads, "Growing up this town was my haven, my neighbors were my friends, I never thought I would be the one who'd put this town in danger". 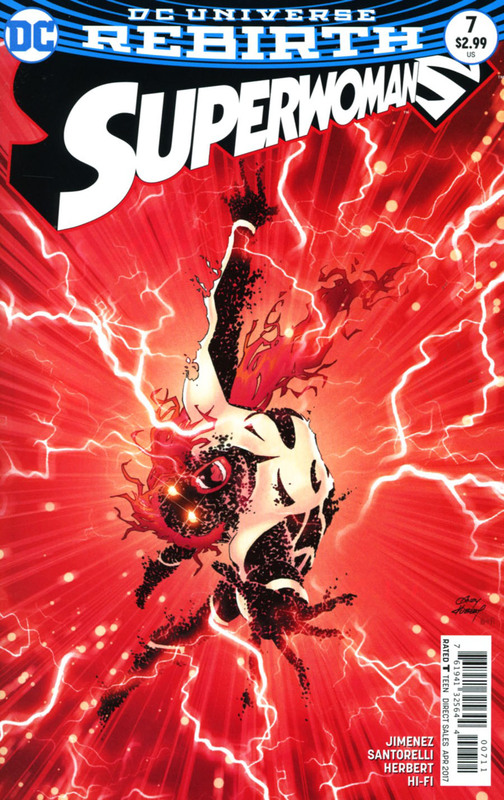 Red Sun and Superwoman (?) are terrorizing Smallville, in their wake is devastation. Lex Luthor tries to reason with Superwoman reminding her that this is not who you are. Our hero struggles with her thoughts, she knows what she is doing is wrong, yet that part of her is being suppressed and she has no will to fight it. Lex tells her that he knows Red Sun is using Red Kryptonite to control her that she would never do this under her own accord. "Stop now or I will be forced to intervene!". She replies, "I came here to search for the source of my power, so do your worse, because I found it." Flash back to the past where a teenage version of Clark and Lana walking to school. Clark stops to help one of the older teachers cross the road when a gentleman named Amos Aimes comes riding up on his motorcycle. His motorcycle is backfiring so Lana offers her help in fixing it as she and her Grandpa used to work on motors before he passed away. In Chemistry class Lana and Lex Luthor get into an argument over who knows more about chemistry, landing them both in detention for disrupting the class. In gym Clark tells Lana she should stay away from Amos, he seems like "a bad seed". Lana tells Clark he is being a little possessive. Knowing Lana is in detention, Clark skips class so he too can get detention, after a couple attempts, and having to insult Shakespeare to his English teacher, he finally gets his wish. In detention Clark walks in to find Lex but no Lana as she decided to jump on Amos's motorcycle and have some fun. The bike hits a pothole and Amos and Lana go over the handlebar towards the ground. A blur comes and swoops up Lana before she hits. Clark asks Amos if he is hurt and reassures him that nothing is broken and turns his attention back to Lana. Lana tells Clark that months ago she told him that she liked him more than friends, "and that just made you all weird, so now that I have moved on your jealous?" Clark replies, "Maybe I am jealous, maybe I like you more than friends too maybe...", and Lana moves in for the kiss. 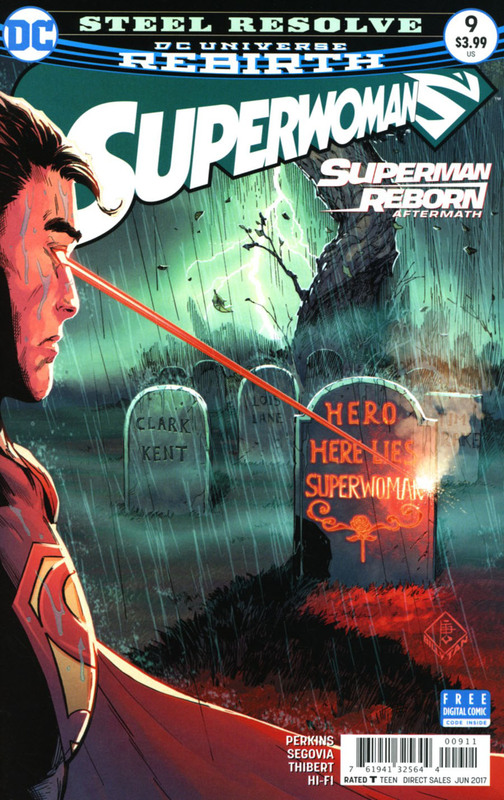 Clark pulls away in pain as the necklace she is wearing starts to glow red. He asks her what it's made of and she replies, "Just some rock that Grandpa found in the field". 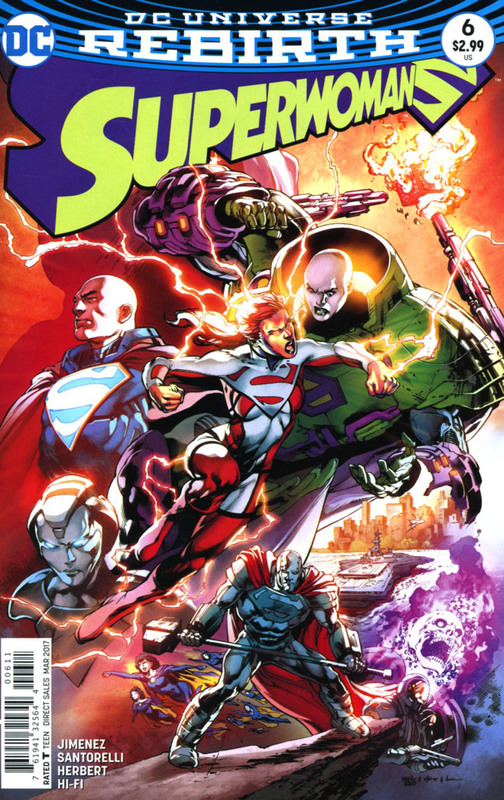 Back to the present, Lex tells Superwoman Kryptonite is not the source of her power, "It is changing who you are". Red Sun attacks Lex and says, "I was not confident enough in high school to fight back Lex, but I am now". Lex replies, "Amos Aimes. I have been watching you." 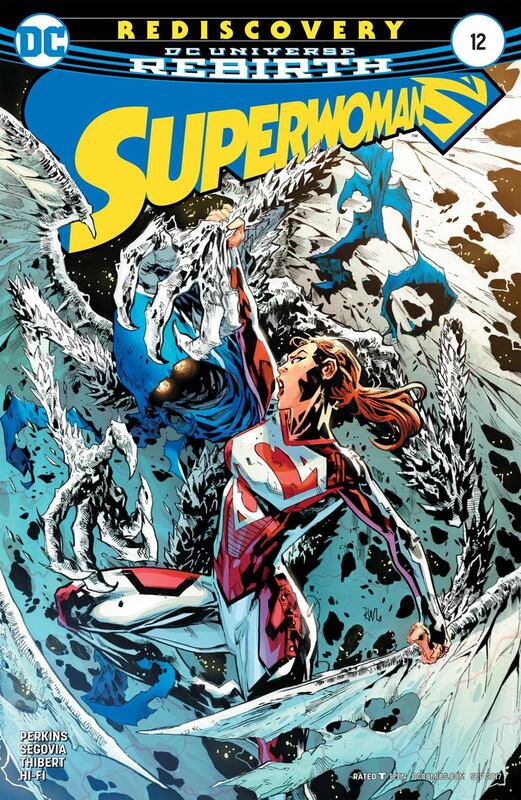 Superwoman and Red Sun continue to beat Lex down, Lana states that the necklace always made her feel stronger, so she sought out the only other person she knew who was exposed to Red Kryptonite. Lex tries to reason with Superwoman once more but she won't listen to him. She is getting ready to attack when a blur comes out of nowhere sending her tumbling across the ground. "Got your message Luthor. How can I help?" says Supergirl. 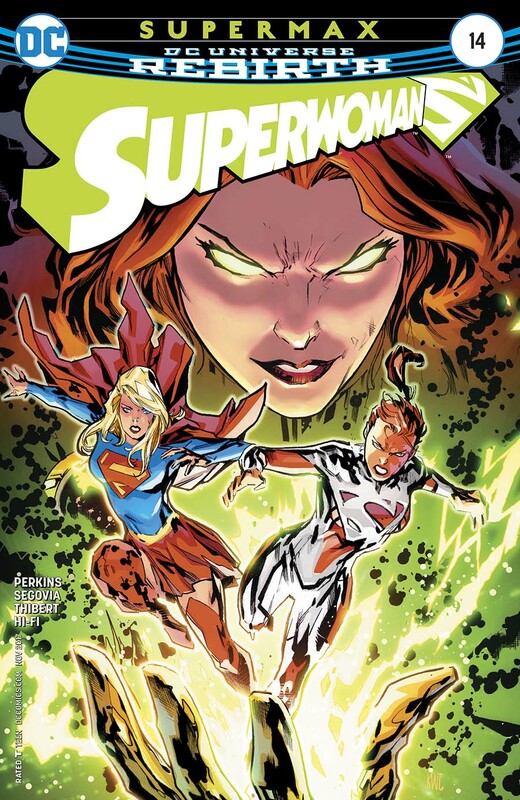 Superwoman and Supergirl monitor the progress of Lana's childhood and Amos, whose prolonged exposure to red kryptonite turned him into the rampaging Red Sun. Several million light years away a woman questions Supergirl's merit and claims that she deserves to carry the honor of high warrior and heir to Almerac. It is time for the real Maxima to return. 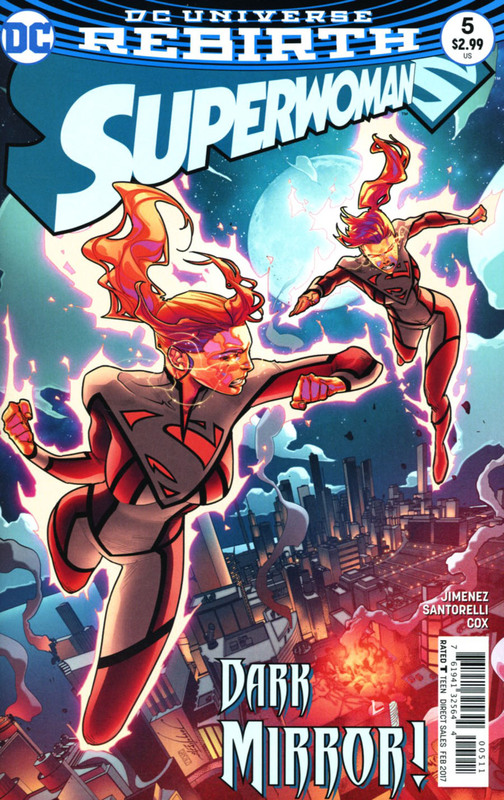 As we return to Earth, Supergirl and Superwoman, who is inside the Kryptonian armor, are taking the fight to Red Sun. Trying to use the suit as a neutralizer to help transformer Red Sun back into Amos. They finally calm him down and bring him back to The Scabbard to continue testing, where they learn that the red K has changed his DNA and that he soon will be unable to return back to human form and will be Red Sun permanently. Maxima comes crashing through the building and a fight ensues between the three women. Maxima appears to be winning when another woman from Almerac comes through the portal and the three of them are able to subdue the first woman. After a brief heart to heart with this younger woman claiming to be Maxima, the three women go back to The Scabbard to check in on Amos. Unknown to them, the three women are being watched by an unknown source. Lana sits at her desk at the Daily Star going over the events of the last few issues and where she got her powers from. "This is just who I am", she says to herself. At the Metropolis Transit Authority, an employee roams the hall upset that he once again has to work the midnight shift. He sits down at a computer when something comes out from the screen and pulls him in leaving behind a trail of zeros and ones. Back at the Daily Star, Lana's boss tells her she is working too hard and it's time to go home. Lana is releasing some built up frustrations by blowing up old outdated training tech when Lois shows up to check in on her. Lana is happy to see her but realizes John Henry must have called her. Los confirms he did but was in the neighborhood researching a missing person's story and was in the area. Lana confesses that everything going on, her Job, John Henry, her friendships, being Superwoman is overwhelming. Lois tells her she's tired and needs to take a break. At Steelworks Lana and company notice a series of black dots appearing on a map across the city. The crew seems to think they might be black holes, then Lana remembers Lois' missing persons story. At John Henry's apartment Lois comes to check on Lana, who hasn't been home in a few days. The two are attacked by a mysterious black cloud. It says that John Henry is strong and needs to be taken so it decides to go after Lois first. Steel grabs Lois and flies out the window, but the Black Cloud catches up to them and takes Steel. He has no choice but to drop Lois but tells her to find Lana. A broken and bloodied Lana appears at Steelworks and says, "...taken John... help me..."
Here is a listing of the Superwoman monthly title from its launch in August 2016 to its conclusion in March 2018. The Writer, Penciller and Inker for each issue are listed within the Comic Index pages, directly below each title's name and number.